Today the McNeese State University and Northwestern State University search committees met to approve the timeline and advertisement for each search. Next steps include search committee meetings at the universities to gather feedback from students, faculty, staff and community members. 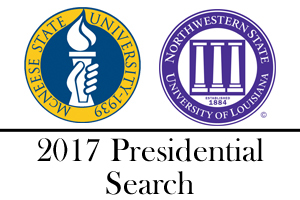 The search committees will meet at Northwestern on March 9 and at McNeese on March 13. Additional information regarding the McNeese search including the approved timeline and advertisement is available here. Additional information regarding the Northwestern search including the approved timeline and advertisement is available here. Yesterday the Louisiana Legislature agreed on a budget plan that spares higher education from cuts after its nine-day special session. The $304 million mid-year deficit will be closed using cuts to state agencies as well as $99 million from the state’s rainy day fund. The Legislature’s focus will now shift to the April 10 fiscal session which will address the state’s tax policies and negotiate the details of the state’s 2018 budget. Today the Board of Supervisors for the University of Louisiana System approved $3.24 million in endowments, first generation scholarships and graduate endowed scholarships. If the Board of Regents fully funds its 40 percent match, the total grows to $5.4 million. With the exception of Grambling State University, all of the Universities of Louisiana are positioned to receive funds. Grambling: approval of a Letter of Intent for a Bachelor of Science degree program in Nursing. Nicholls: approval of a Letter of Intent for the Bachelor of Science in Criminal Justice degree program. Northwestern: approval to revise the University’s Mission, Vision, and Core Values Statements. UL Lafayette: approval of a Letter of Intent for the Master of Arts in Teaching (MAT) in Elementary Education with concentrations in Elementary Education and Elementary French Immersion. UL Lafayette: approval of a letter of Intent for UL LIFE, Learning is for Everyone (Intellectual Disabilities Program in the College of Education) non-degree program. UL Lafayette: approval of the Concept Proposal for a K-12 Laboratory School at the University of Louisiana at Lafayette. ULM: approval to amend its Memorandum of Understanding with SouthArk Community College. UNO: approval of a Pathway to Interdisciplinary Studies with Northshore Technical Community College. UNO: approval to enter into a Memorandum of Understanding with Indian Maritime University, India. Southeastern: approval of a contract with Mr. Christopher McBride, Head Women’s Soccer Coach, effective December 1, 2016. Southeastern: approval of a contract with Mr. Ron Roberts, Head Football Coach, effective December 1, 2016. LA Tech: approval to name the auditorium in Lomax Hall in honor of the late Mr. John D. Hoogland. McNeese: approval to enter into a land lease agreement with the McNeese State University Foundation. ULM: approval of the demolition of the Anna Gray Noe Alumni Center. ULM: approval of the demolition of the storage building located at 4709A Bon Aire Drive on the campus of the University. ULM: approval to proceed with the Act of Donation for two vacant lots located at 901 and 903 North McGuire Avenue, Monroe, Louisiana. UNO: approval to lease the Athletic Center (TAC) Building to Educators for Quality Alternatives, Inc.
LA Tech: approval to enter into a ten-year lease-purchase of 12 aircraft and to submit a request in the name of the Board of Supervisors for the University of Louisiana System for approval of the lease-purchase. LA Tech: approval to enter into a Cooperative Endeavor Agreement with Ruston Country Club, LLC for the public purpose of educating students and providing recreational opportunities for students. McNeese: approval to allow a student referendum in April 2017 for student self-assessed fees as follows on a single ballot: Greek Life, Athletics, and Cowgirl Kickers. McNeese: approval to allow a student referendum in April 2017 for a student self-assessed Band Fee. Nicholls: approval to repurpose the La Pirogue Yearbook student self-assessed fee. UL Lafayette: approval of special pricing for the online Master of Business Administration degree program. ULM: approval of a contract with RTG & Associates to market a dual enrollment leadership program and to recruit high school students nationwide. UL System: approval to adjust non-restident tuition and fees at Nicholls State University, University of Louisiana at Lafayette, and University of New Orleans as allowed by Act 455 of the 2016 Regular Session of the Louisiana Legislature. UL System: approval of Payments made by nonprofit organizations to employees of the University of Louisiana System during Fiscal Year 2016 in accordance with provision of the Louisiana Revised Statute (R.S.) 17:3390(F). Grambling: approval to appoint Dr. Ellen Smiley as Provost/Vice President for Academic Affairs, effective March 1, 2017. UL Lafayette: approval to appoint Dr. Jessica Leger as Interim Director of Athletics, effective December 1, 2016. UL Lafayette: approval to appoint Dr. Bryan Maggard as Director of Athletics, effective March 1, 2017. UNO: approval to appoint Dr. Matthew Tarr as Vice President for Research and Economic Development, effective January 18, 2017. McNeese: approval to authorize the University President to take necessary actions to remedy a dispute related to an athletic game guarantee.